The first version of TibEd was released several months after the release of Command & Conquer: Tiberian Sun. Only basic editing was supported in that version, and current versions of TibEd offer much more. But the essence of TibEd remains the same: quickly editing units through an interface, and not hiding any options (like some other editors do). This makes TibEd the choice for both beginner and pro mod makers. Who says Crazy Ivan should be weak? Another advantage of TibEd is that it supports multiple games. Once you get to know how TibEd works, you can be sure most of that knowledge also applies to the editors for other games. 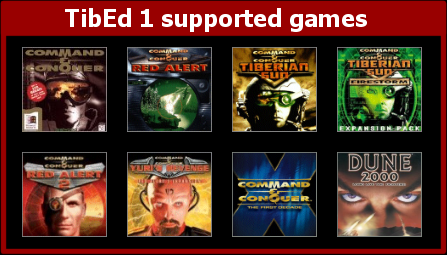 Games supported at the moment are Tiberian Sun, Red Alert 2, Dune 2000, Red Alert 1 and the old Command & Conquer: Windows 95 edition. 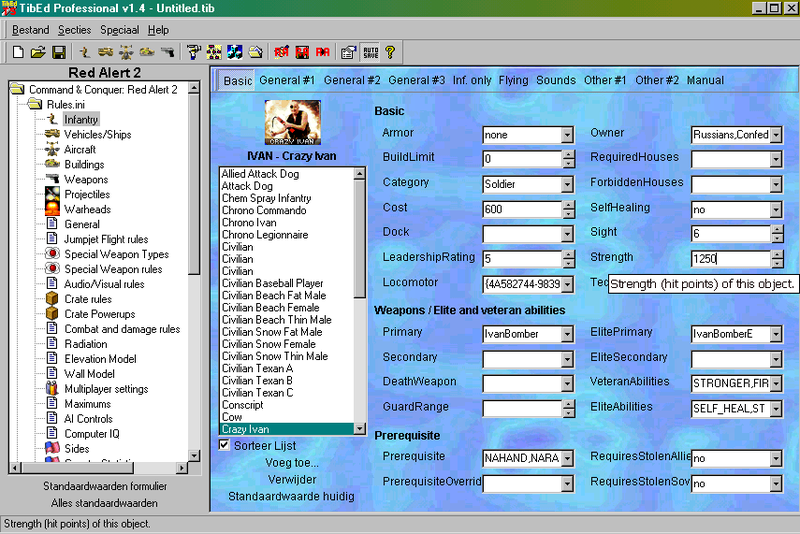 Edit multiple ini files (such as Rules.ini, Art.ini and others, depending on game). Who-Uses-What Browser: allows you to look up advanced queries, like: which units uses a specific weapon? Manual editor integrated in case you don't want to use the interface (check out the Manual tab page). Then you'd best go to the special screenshots page. You can download a freeware version from the download page.